In the 1980’s “coolers” were trendy. A “cooler” was wine mixed with soda water, lime, lemon, and sugar. Bachelor Cooler Winery was started in 1985 by Roseburg physician Dr. Sergio Skinner and wife Vivian Cervi-Skinner. Bachelor Cooler Winery was really not a winery. Bulk wine was blended with various ingredients. The signature product “Bachelor Red Wine Cooler” was Pinot Noir with flavorings. 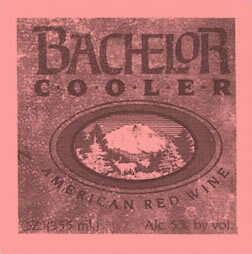 The label was a picture of Mount Bachelor, hence “Bachelor Cooler”. The official business name was S.C.S. Cellars, probably created by the first letters from their last names Skinner & Cervi-Skinner. It is not known how long the Skinner’s remained in business. S.C.S. Cellars conducted business at 514 Candy Lane, Roseburg, OR 97470.